The Napoleon River Bandits are currently fundraising for the upcoming 2019 season. If you are interested in finding a way to help, please check out the Donate link on the side of the page. Also, make sure you click on the Support Our Sponsors link at the bottom of the page and check out who has already made an impact on the 2019 season! 2018 Great Lakes Regional Website! 2013 Great Lakes Regional Champions! Witness the last out & Dog Pile HERE! Games will be played at Mercy Field in Holland, Ohio. National Headquarters have set certain parameters when it comes to field specifications. Lights, field dimensions, sizeable press box area, ample permanent seating and hotels are just a few of the requirements that need to be met. Mercy Field meets all of the specifications and it also is an all turf field which was a huge determining factor in getting the bid. Since 1998, the River Bandits Baseball program has been committed to excellence... top-shelf players, exceptional staff, and consistent results. The River Bandits have become one of the most well-respected American Legion Baseball programs in the United States. The outstanding results of the program are a reflection of everyone involved, past and present - their commitment, work ethic, character, and passion for the game of baseball. 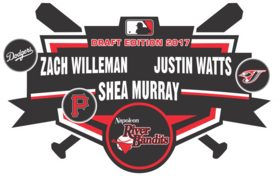 The River Bandits' success is second to none, measured by the outstanding season results, the number of participants that have continued playing at the college level, as well as the professional level. 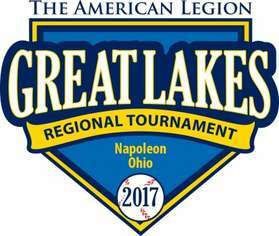 The River Bandits are sponsored by the American Legion Napoleon OH Post 300, for which their support is a direct influence on the program's success. Since 1925, the American Legion has sponsored a nationwide youth baseball program. During these past eight decades, millions of young players have enjoyed playing baseball. The American Legion, and their 2.8 million members, have raised millions of dollars each year for players to learn the importance of teamwork, discipline, leadership and good sportsmanship. The American Legion sponsors American Legion Baseball to give players an opportunity to develop their skills, personal fitness, leadership qualities, and compete at the highest levels. Each year there is an average of over 5,000 American Legion Baseball teams in the US, Canada, and Puerto Rico, with more than 90,000 players, age 15 to 19. On average, 55 percent of all Major League Baseball players have participated in American Legion Baseball, and nearly 90% of all college players. 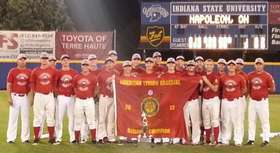 Annually, the American Legion National Headquarters spends over $1 million to operate and host 64 teams that qualify for the National Tournament. Each year 1,280 players and coaches on 64 teams compete at eight Regional Tournaments, with the Regional Champions advancing to The American Legion World Series. American Legion Baseball is the only amateur youth baseball program that funds 100% of the cost of hotels, transportation, meals, umpires, and baseballs for this National Tournament. Congratulations to Shane Geer of Defiance on being the $250 Grand Prize winner in this year's Riverbandit Lotto Raffle! on Twitter at @napoleonbandits or @legionbaseball. On the web at Great Lakes Regional Tournament. 2013 American Legion Great Lakes Regional Champions - Qualify for the AL World Series!! on Twitter at @legionbaseball. On the web at www.Legion.org/Baseball. All games can be watched on ESPN3 HERE. Follow LIVE play-by-play GameTracker, ESPN3, boxscores, photos & brackets HERE. Witness the 2013 Regional Championship Dog Pile HERE!